Building their own home was something Matthew and Emma Greenland had always wanted to do. 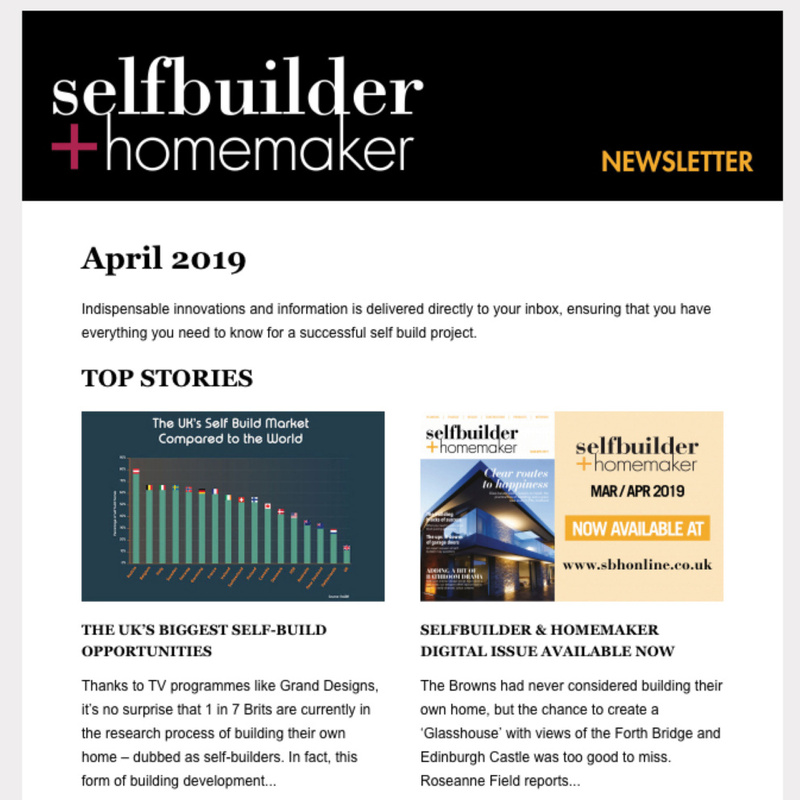 A builder by trade, working on private residential projects, Matthew had the inside knowledge on the merits of doing it themselves, as well as the necessary skills. Matthew and Emma had been keeping their eye out for suitable plots around their village – St Dogmaels on the Pembrokeshire coast – for a while, as they were after something with a good amount of land to house Emma’s horses. 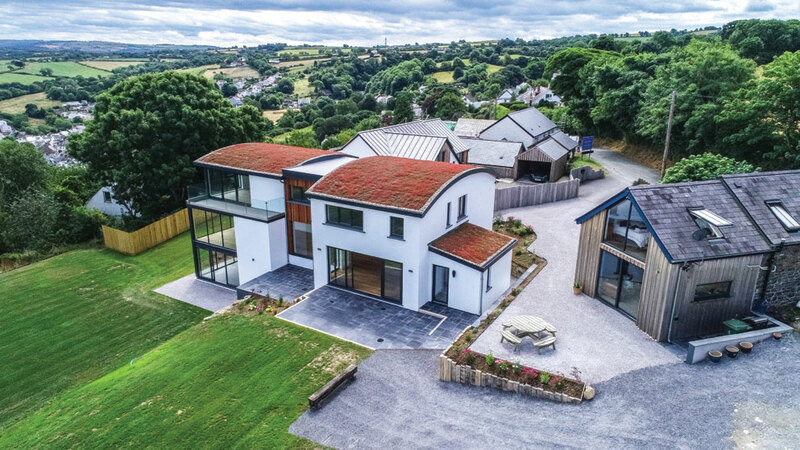 They finally found an elevated 10-acre plot with great views overlooking the village and the River Teifi that had been up for sale for some time, and it won them over. 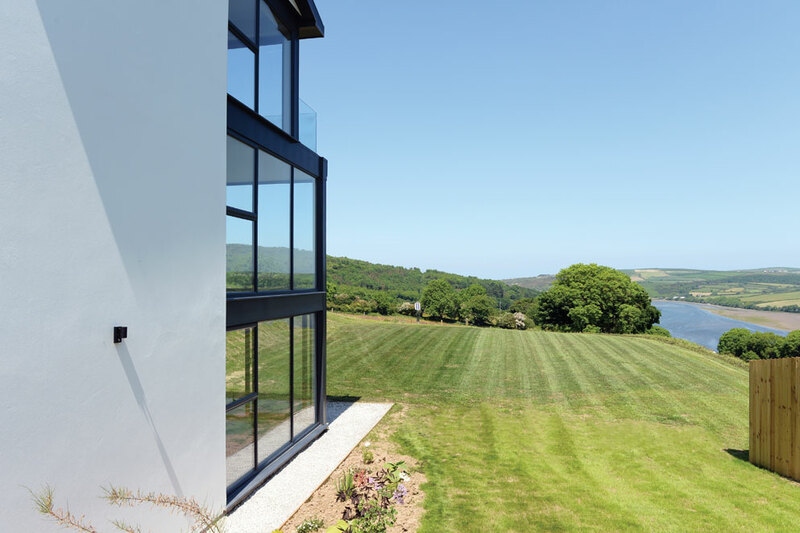 “Standing on this plot looking at the view, we just said ‘this is it.’” Matthew tells Selfbuilder & Homemaker. The plot was actually part of a group of three situated on an old farmyard. 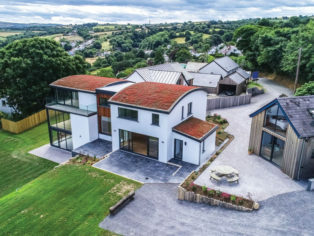 These plots had been given planning consent twice before – originally as four plots for semi-detached houses which lapsed after five years, then for three detached – but nobody had bought or built on them due to what Matthew says was “bad design”. He approached the owner with a view to doing a deal. He proposed to buy the large plot at the top which came with the farm’s agricultural land, while an architect he had worked with previously would buy the other two, situated between Matthew’s plot and the adjacent farmhouse, to develop and sell on, both of which Matthew would also build. “It is a sort of complex of different properties that all work together,” he says. 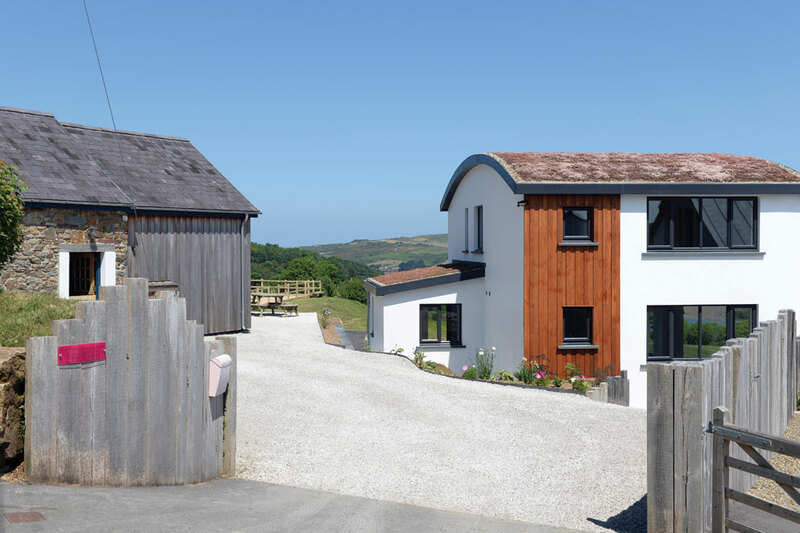 The fact the owner had been marketing the land for a total of seven years meant the couple were able to get a good deal, which also included an old pig shed, which Matthew transformed into a three-bedroom cottage. They bought the site in October 2013 and moved into the converted pig shed in May 2014 once their previous house had sold. This would serve as an excellent base for Matthew, Emma and their three children while the main house was constructed. “We lived onsite in a caravan, but within two months we pretty much had the conversion finished because I didn’t want to go through winter in a caravan,” Matthew says. They worked closely with their architect, Roger Bell, who Matthew already had a good working relationship with, and came up with a design inspired by houses they’d seen on holiday in Australia. In fact, it’s their love for the country and dream to move there one day that has seen them put their dream home on the market. In February last year, midway through the build, they discovered they had been granted visas to make a permanent move down under. Matthew and Emma decided to go the route of providing a building notice, which meant they didn’t have to have full, detailed plans drawn up for their application. “We saved quite a lot of money not having to have detailed drawings,” says Matthew. Being a builder, Matthew took on the majority of work himself, along with his team. But this naturally meant fitting it in around other jobs. “I was busy doing other stuff so we built the main house over the space of two to three years, taking bites at it when we could,” he explains. “We got the slab in, then we worked to get the blockwork up, then we came back and did the roof and got it watertight. 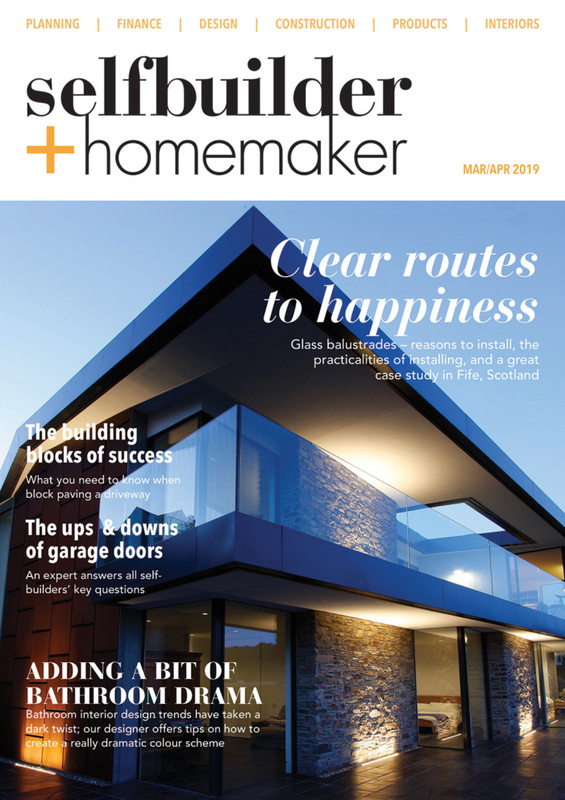 It was a stage by stage process.” Hitting a timescale wasn’t Matthew and Emma’s biggest concern, as they were “comfortable” in the barn conversion. The only work not undertaken by Matthew’s team was the plumbing, electrics, and steel frame. He also worked with a structural engineer to figure out the logistics of certain aspects. Having not had full drawings done meant a lot of structural decisions were made on the hoof, as well as cost-saving tweaks. “My experience in the building trade made it a lot easier,” he admits, adding: “I’ve enjoyed doing this with Emma, designing it as we go.” Matthew’s experience also meant he knew plenty of local places to source materials. Due to the slope, the basement level doesn’t cover the same footprint as the rest of the house. The entrance is at the level above, the front door leading into a large Australian- inspired open plan living/dining/kitchen area – a must-have for Matthew and Emma – along with a pantry. 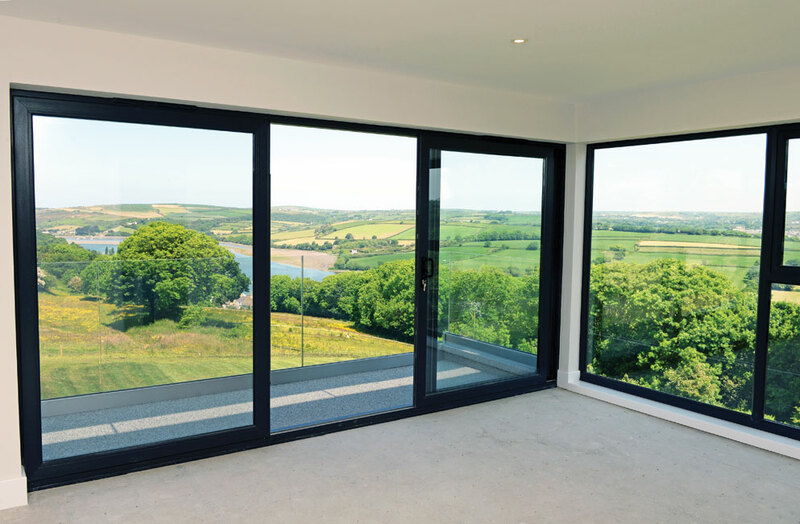 The angle of the front door means guests are immediately faced with floor-to- ceiling windows in the opposite corner, delivering the panoramic view. “The main thing when you walk through the front door is you see that view,” Matthew explains. Making the most of the surroundings was a high priority in the design. Having both lived in and worked on Welsh cottages and farmhouses, Matthew wanted something different. “It’s great to have that ‘comfy’ feel, but we wanted to have something that could let plenty of light in and feel airy and open,” he says. Matthew used a couple of different construction methods. The three-storey end of the property is built using steel frame in order to get the height and large openings they wanted, while the rest is of traditional block construction. The house is finished with a mix of white render and cedar cladding, and features hidden gutters to maintain the minimal aesthetic. The house is heated with a mix of underfloor heating and anthracite radiators. These are fed by a gas boiler, although they are also installing solar panels to help with heating hot water. Originally the pair considered including additional PVs and rainwater harvesting, but, explains Matthew, “That came after we found out we had our visas, so some things had to take a little bit of a back seat.” However, future owners could incorporate additional sustainable features, he says. The site also has planning permission for a manège – which has been constructed – and stables, which were originally intended to house Emma’s horses before the move to Australia became a reality.